The Greenhouse | Hiring Opportunity: CRA Showcase of Services & Career Fair! 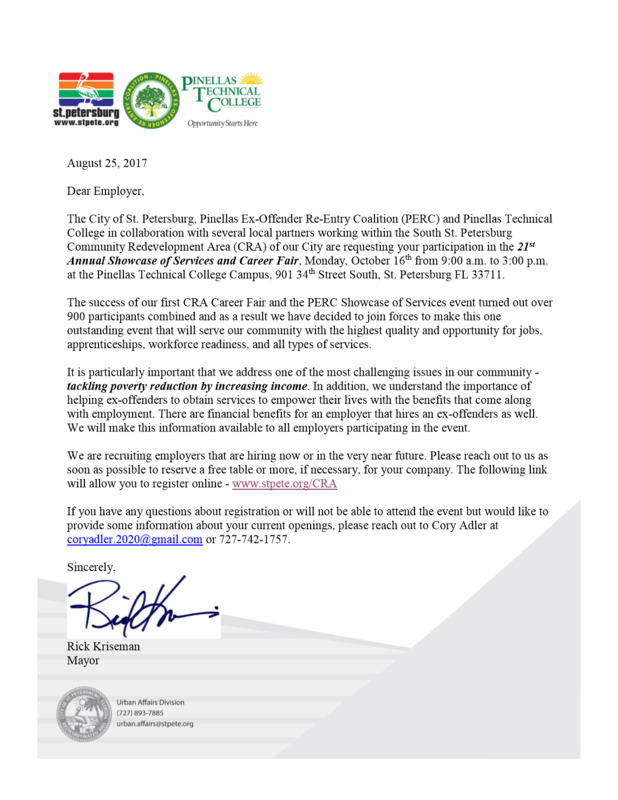 Hiring Opportunity: CRA Showcase of Services & Career Fair! Are you looking to hire at your business? For employers looking to hire now or in the near future, consider setting up a table at the 21st Annual Showcase of Services and Career Fair – free of charge!Coordinated by the City of St. Petersburg, Pinellas Ex-Offender Re-Entry Coalition (PERC) and Pinellas Technical College, along with several other local organizations working within the South St. Petersburg Community Redevelopment Area (CRA), this event will offer local business owners the opportunity to recruit and hire, while positively impacting our local economy and contributing to poverty reduction in St. Petersburg. Contact us for general advice or one-on-one assistance from a business counselor. ©2019 Greenhouse. All rights reserved.